You can use several different essential oils for migraines, and you can use them in several different ways. Although essential oils can't actually stop the process of a migraine in the brain, they can help relive many migraine symptoms. Essential oils are made by steam processing roots, wood, flowers, leaves, berries or resins. You absorb them into your bloodstream when you inhale them, and they interact with your body chemistry. The use of essential oils is a form of aromatherapy, a type of healing first practiced in ancient Egypt. You can use these essential oils to treat specific symptoms of migraines: peppermint or ginger for nausea, basil for headache and helichrysum for inflammation. If your migraines cause you to be congested, eucalyptus oil can be helpful. You can use chamomile, clary sage, or lavender to help you relax when a migraine occurs. Sweet marjoram causes a slightly sedating effect to help you cope with migraines. Use marjoram oil carefully, especially if pregnant, because it can stimulate menstruation. You can use essential oils for migraines in several ways--applied to the skin; in candles; in diffusers; inhaled from a bottle, tissue, or piece of cotton; put in your bath water; or added to hot or cold compresses. If you want to use essential oils in your bath, add them undiluted to your bath water. Aromatherapy diffusers disperse the oils into the air in your room. 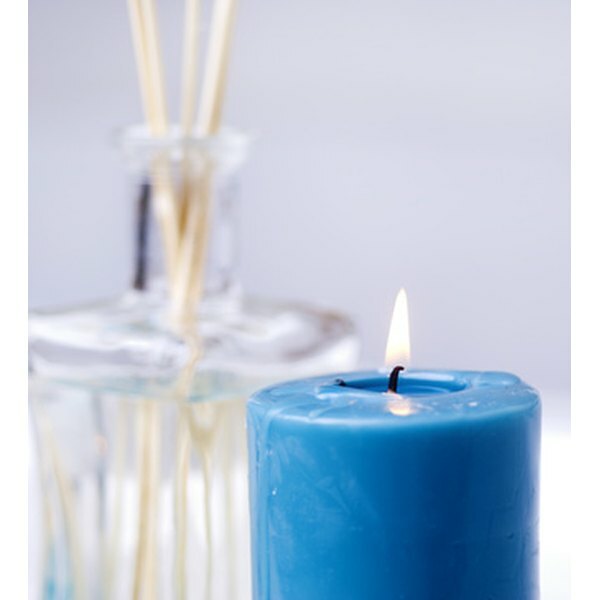 Aromatherapy candles made with essential oils introduce the oils and fragrance into the air. Always dilute essential oils in a carrier oil before applying them to your skin. Essential oils are too concentrated to be safely applied to the skin without diluting them. Sweet almond oil and apricot kernel oil are appropriate carrier oils for all skin types and help with soreness and inflammation. Fractionated coconut oil is a clear, light liquid that keeps well due to its long shelf life. It also has the advantage of easily washing out of clothes and linens. Choose the oils you want to use for your migraines and prepare them in advance. Fill your bottle three-quarters full with a carrier oil. Then add essential oils one or two drops at a time until you have achieved the blend you want. A few drops of essential oils are sufficient for a 15ml bottle. You also can use small roll-on bottles to prepare blends that can be applied to the temples, hands or other spots during a Migraine. Once oils have been blended with a carrier oil, you can put a few drops on your pillow to help relieve symptoms. Use tinted glass bottles for blending and storing essential oils to protect them from light. To best preserve your oils, store them with the bottles tightly closed, in a cool room, away from light and heat sources. Avoid basil essential oil if you are pregnant or if you have a history or seizures. If you're pregnant, have an inflamed gallbladder or have gastroesophageal reflux disease, you should avoid peppermint oil. Also do not use peppermint oil for infants and small children. If you are pregnant or nursing, or if you're going to consume alcohol, avoid using clary sage oil. Teri Robert began writing about headache disorders in 2000. Her articles appear on MyMigraineConnection.com and HelpForHeadaches.com. Robert wrote "Living Well with Migraine Disease and Headaches," and received the National Headache Foundation's Patient Partners Award for ongoing patient education, support and advocacy. She holds a Bachelor of Arts in English from West Virginia University, and over 100 continuing education credits in headache medicine.